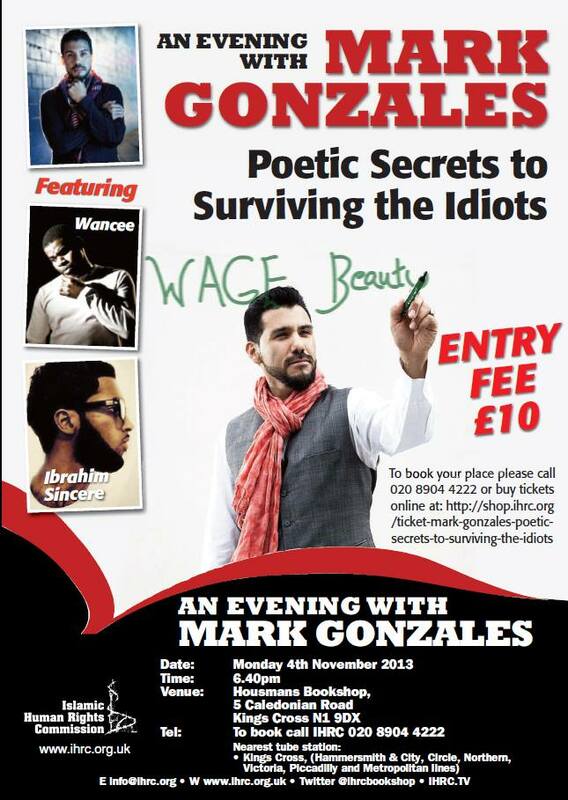 Join IHRC today at 7pm to listen and share with Mark Gonzales. This one night only event is for all you whose head hurts from the amount of bigotry & stupidity that is being circulated in every day conversation. Creative Mark Gonzales aggregates the stories & wisdom that has been shared with him across the globe to provide an answer to that age old question: “How does one stay alive in a time when it is almost painful to be intelligent? Buy your ticket now, tickets will also be available on the door. Nearest tube / train station: Kings Cross. For more information please contact the IHRC office on events@ihrc.org or call 020 8904 4222. This event will be broadcast live on www.ihrc.tv.